When Michigan woman Amanda Dietz delivered a speech about paying off student debt, she had no idea that luck was about to visit her. In her speech she mused about how nice it would be to win the lottery to be able to pay off her debts. Katrina Vosler was only too happy to spend $100 to $200 a month playing the lottery. One time when she went to visit the Four Winds, a customer of her cleaning business, she bought a ticket thereby mixing business with pleasure. Rachel Lapierre has lived the good life. She had once been Miss Quebec, worked as a glamorous model, and later ran her own modelling school. But there was one thing she wanted to do most – help other people. If there are people grannies love most, it has to be the grandchildren. 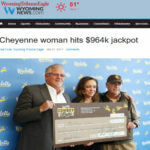 That’s why it shouldn’t be a surprise when grandchildren benefit most from their granny’s lottery winnings. Tommy Parker has developed a routine since he retired. Buy a newspaper at 9:30 in the morning and then also purchase lottery tickets which he kept under a biscuit barrel. This lucky man almost threw away a $24.1 million lottery jackpot because he doesn’t check his tickets regularly. His habit of watching the news on TV saved him. 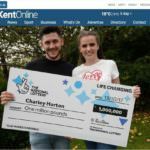 A railroad worker struck lucky on Friday the thirteenth by winning £1 million in the Euromillions lottery. The next day he just had a haircut and went back to work.